Super-Grip Vacuum Cup Holders enable the user to obtain a firm and secure grip, when moving or installing flat marble and tile sections, and many other smooth, non-porous materials. Lifters are made of cast aluminum with a baked on gray hammer-tone finish. The gripping pads are made of pure, natural rubber. 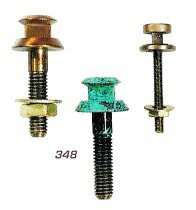 Triggers are made of rust-proof hardened spring steel. USE ON ONLY CLEAN , NON-POROUS AND DRY SURFACES. B170/1490 NICHE DRAPE (FINISHED SIZE - 14 1/2" x 14 1/2") ROD SIZE 11" TO 18"
(FINISHED SIZE - 26" wide x 22" long) ROD SIZE 18" TO 28"
Crypt Drapes are handsomely made from rich 100% acrylic fabris. Drapes come complete with all necessary hardware. Available in Hunter Green and Burgundy. Custom sizes and colors available upon request. 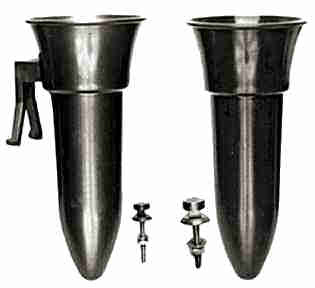 Tri-head construction eliminates the need for more than one vase lifter. 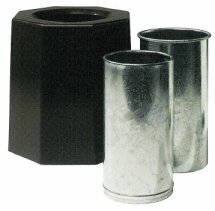 The three heads fit 4", 5-1/8" and 7-1/4" vases. Features adjustable length, turn of the wrist will lock any desired length from 6' to 12'. Made of "Light-Weight" tubular aluminum. 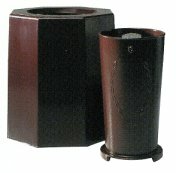 Hepburn Superior Spun Crypt and Niche vases are custom manufactured. These bright, elegant vases add an extra touch of thoughtfulness to your mausoleum. Rings and vases featured in two finishes and three sizes. 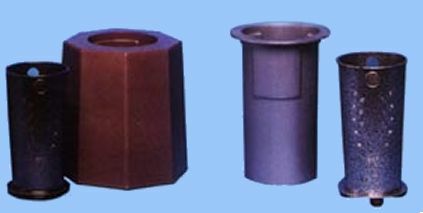 Our attractive polypropylene plastic vases are designed and manufactured by Hepburn Superior Inc. to be strong and durable in all types of weather. Hepburn Superior's redesigned bracket and attachment eliminates vase tipping with the added weight of flowers and water. The newly designed double wall and single wall polycasings will accommodate either ground level or half exposed vases. 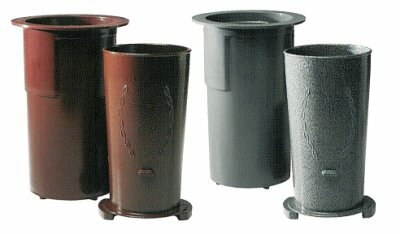 Vases are constructed of heavy cast zinc for beauty and durability. They are attractively finished in textured antique bronze or gray. 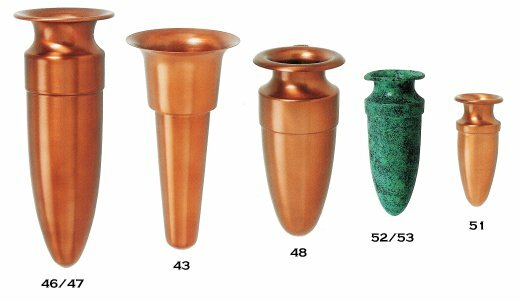 When either ground level or half exposed vase is reversed in its casing, it will flush with the ground for easy maintenance and protection while not in use. iron, features rolled seams and edges. adding our double or single wall polycasings. 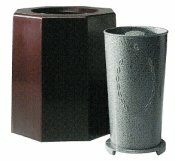 The Winona Cemetery Flower Vase is reliable, attractive and at the top of utility vase line. A quick twist of its adjustment ring allows you to raise the flowers above ground level; a quick turn the other way lowers flowers to ground level. When not in use, the vase reverses inside the casing to protect the unit from all weather elements. 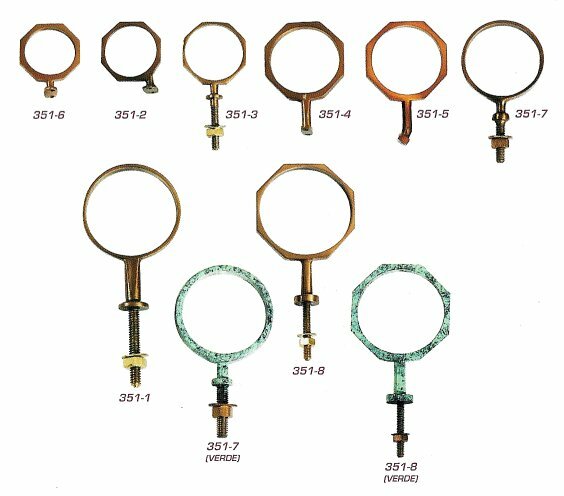 No clogging, no jamming - just low maintenance, easy installation and removal. Made of rugged, heavy gauge galvanized steel, each unit is beautifully finished in green enamel. Simplicity means economy and durability with these ground level vases. 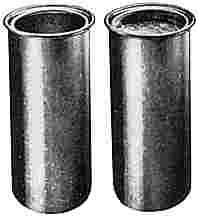 Use with single or double wall Polycasings to add longevity to the units. Fully exposed when open, the GRECIAN Series cast vases are available in four handsome finishes and include a 5" diameter stainless steel casing with a locking ring at the top Guard chains are optional. 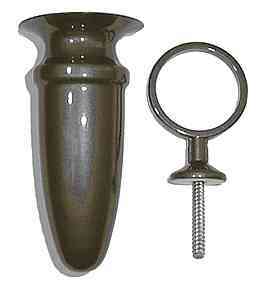 Vase stands 8 1/2" high when open. 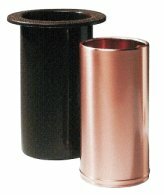 Half-exposed when open, the SPARTAN vases are available in three finishes and choices of a zinc casing or 4 1/2" diameter Polycasing, Extra-heavy die-cast zinc vase will not float when reversed in casing even if turf is flooded. Vase measures 7 3/4" high x 4" diameter. 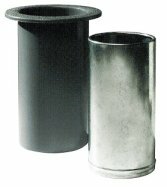 Available as ground level or half-exposed when open, the THRIFTY Series cast zinc vases provide maximum economy with durability. Handy finger holes also facilitate bouquet tie-downs for high wind seasons. Vase measures 7 3/4" high x 3 3/4" diameter. Casing will fit into a 4 1/4" marker coring. Spun bronze and plastic molded mausoleum vases add professional thoughtfulness and profit to crypt and niches installations. The spun bronze unit pictured below is available in stain bronze lacquer or verde finishes. A choice of saddle & a button or ring hanging system cover most application requirements. 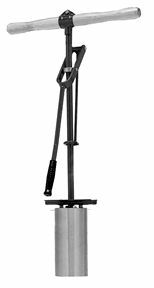 Our new vase lifter stand easily holds up to 12 lifters in a convenient upright position. Unit stands 5 feet in height and finished in an antique silver power coat. remover built in. Handle is 33" from bottom.